Whether you are a resident or tourist, there is no one better to spend time out on the water with than an “authentic” Turks & Caicos native. Besides safely piloting the boat through gleaming turquoise seas, you will be introduced to the best snorkeling, fishing and beachcombing spots, plus hear countless tales of a life spent by the sea. And when your captain comes from a long line of sea-faring survivalists, all the better! That’s what you can expect when you take a trip with Talbot’s Adventures Fishing & Tour Excursions. When I arrived for an interview with Levardo Talbot, the owner of Talbot’s Adventures, I met instead a spry, slightly weathered senior who was peering into an i-Pad at pictures of iguanas. A big grin and strong handshake later, and I was introduced to Oscar Talbot Sr., Levardo’s 76-year-old father, and the source of his son’s extensive skills in the sea. Hours flew by as the senior Talbot carefully detailed with pride his family’s long history of boatbuilding, salt raking, fishing, and, surprisingly, tourism, dating back over 100 years in the Turks & Caicos Islands. At seventy-six years old, Oscar Talbot Sr. is a living legacy of his family’s long history of seafaring. This photo was taken at Salt Cay’s port of entry, Dean’s Dock, at the Salt Shed around 1963. 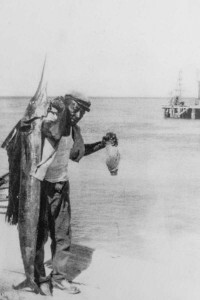 Like most Island men, both Oscar and his father would often spend weeks out on the banks collecting and drying conch, then sailing to nearby Haiti to sell or trade for goods not available at home. Folks from the more-fertile Caicos Islands would supply them by boat with corn, potatoes, fruits and vegetables for their on-board larder. Because there was no refrigeration, everything had to be preserved (or “pickled”) with salt for storage. Oscar recalls that fish were filleted, scorched (hash-marked) and “corned” with salt. Lobster didn’t preserve well, which explains why it was not such a popular foodstuff. Oscar Talbot did not start diving with a mask and snorkel until he was twenty years old. He remembers that visiting treasure hunter Lew Black introduced him to the apparatus. “At first I was not comfortable and I swallowed a lot of water. But I had that macho spirit, and when I saw the fish come around, I liked that so much I forgot about my fear.” Oscar soon shot his first “Gillen beau” with sling and spear, eventually diving to 100 feet over the wall, holding his breath for long minutes. Because the Islands are surrounded by protective reefs and walls, it was crucial to be able to pilot small sloops and boats through cuts in the reef to get to open sea. When high winds blow, waves block the cuts, making it treacherous to pass through. Oscar, like Norman before him and Lavardo today, bears the rare ability to “count waves,” advising captains exactly when to set off to safely navigate the cuts near Grand Turk and Salt Cay. Following in his father’s footsteps, Oscar Talbot Senior married Ophelia Smith, the couple raising fourteen children on Salt Cay. (Oscar attributes his fecundity to his habit of eating three raw conch daily!) He, too, earned a living as a fisherman, yet also manned fishing trips for tourists, advised visiting marine biologists from the Smithsonian Institute, worked with a science lab in Grand Bahama, and continues to free-dive lobster and conch. Oscar has long been an advocate of both protecting the local ecosystem and empowering native fishermen, with strong, cutting edge ideas about both subjects. Early on, he saw the dangers of harvesting undersized conch, lobster and fish and the importance of making sure that Islanders benefited from the fruit of the sea. He spent four years on the Fisheries Advisory Council, and in 2000, was honored for his contribution to the industry. He continues to act as a fisheries consultant overseas. Surprisingly, the senior Talbot has taken to Facebook like a fish to water! After receiving an i-Pad as a gift, he signed up on the social networking site and was quickly “befriended” by his bevy of acquaintances. In fact, over 250 people across the globe wished him a happy birthday this year! Thirty-five year-old Levardo Talbot sat quietly through the long interview with his father, occasionally nodding his head or interjecting a comment. Father and son agree that Levardo is the sibling that most inherited his father’s love of the sea. Oscar recalls, “Levardo had no fear of the ocean. What I do, he do. We’d go out on the boat from sunrise and not come back until after dark. He took the blame when his mother was angry that we were late coming home.” Levardo also bears Oscar’s conservation-minded gene. He worked for ten years as a Department of Environment and Coastal Resources (DECR) Fish and Marine Parks Conservation Officer, amassing extensive training and experience in the finer points of marine ecology and conservation, committed to the sustainability of the fishing industry and ecosystem to which his family depends on for survival. In his spare time, Levardo takes great pleasure in restoring and repairing boats, learning from the great South Caicos mechanic Chubby Cox. During his tenure with the DECR, Levardo gave presentations to local schoolchildren, was a representative during the Trouvadore slave ship wreck excavation, trained with the US Coast Guard and ReefCheck, and, most recently, assessed the reef for damage from an unmoored mega-yacht. With a fleet consisting of: a 38-foot power beach catamaran, 32-foot Boston Whaler Outrage, 30-foot Grady White, 29-foot sportsfish Mako, and 18-foot Well Craft ski boat, Talbot’s Adventures can cater to just about any on-the-water experience. Besides Levardo Talbot, the company is staffed by two other “professional natives”: fifty-year-old Tony Morris and Zachery Rigby, a twenty-four-year-old “youngster” who grew up diving these waters. The most popular tours include bottom and bone fishing, beach cruises to the Caicos Cays and iguana-viewing, and more free-form, “off the beaten path” trips, including day excursions to North and Middle Caicos. All include free pick-up from Grace Bay locations, cocktails, soft drinks and snacks, snorkeling equipment, and lunch on board or a beach barbeque for full day tours or charters. Guests can also enjoy dining on their catch of the day (cleaned and filleted by Talbot’s) at Flamingo Café on Grace Bay Beach, or other native restaurants on-island. With locations at both the Cultural Market between Club Med and Ocean Club East, and at Walkin Marina at Heaving Down Rock, Talbot’s Adventures is perfectly positioned to access prime bottom, deep sea and bone fishing sites with a short boat ride. His office also serves as a watersports information center. Levardo and crew specialize in planning custom trips that cater to each group’s needs, and enjoy throwing in a secret spot or two! In season, you can try your hand at conch or lobster diving or simply spend the day on a secluded island or cay. Past guests seem overwhelmingly thrilled at the great catches Levardo and his team manage to lead them to. “Captain Levardo! The Reel Professional” is also the only local kiteboarder, offering private boat charters for kiteboarding down-winders to remote kiteboarding spots. For more information or to make a reservation, visit talbotsadventures.com.